Agriculture is responsible for 70 percent of global freshwater consumption, in large part due to our prevailing agricultural model based on monoculture of annual crops. This strategy requires annual tilling, which damages soil health and lowers its water absorption capacity. Annual crops also have more feeble root systems, which are more water-intensive because they are less capable of drawing water from existing moisture in the soil. Switching to perennial crops that do not require annual replanting or tilling would solve these problems, but industrial agriculture is deeply entrenched. Luckily, decades of perennial crop research has led to some promising innovations, including Kernza, a perennial wheatgrass developed by the Land Institute. 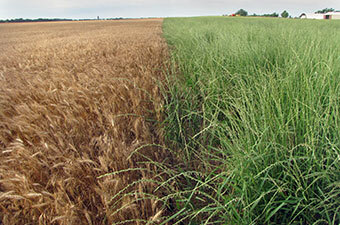 Plovgh (pronounced “plow”) is a perennial grain company that the Land Institute has partnered with to commercialize Kernza. So far, they have had great success. Patagonia Provisionswas the first to take a product using Kernza to market, with its beer, called Long Root Ale. Other Kernza products have hit the market since, including a Kernza pasta, but the next big step is the 2019 launch of Kernza-based General Mills products under the Cascadian Farm brand. Cascadian Farm, a pioneer in the organic food movement, and parent company General Mills today announced their work with The Land Institute (TLI) to help commercialize organic Kernza, a perennial grain (intermediate wheatgrass) and wild relative of annual wheat, whose deep roots show promise to increase soil health, carbon sequestration, water retention and enhance surrounding wildlife habitat. The sweet- and nutty-tasting grain lends itself particularly well as an ingredient for cereal and snacks. Cascadian Farm has agreed to purchase an initial amount of the perennial grain which allows TLI to arrange with farmers to plant on commercial-scale fields versus the test sized plots currently being grown. In addition, General Mills approved a $500,000 charitable contribution to the Forever Green Initiative at the University of Minnesota in partnership with The Land Institute, to support advanced research to measure the potential of Kernza to significantly reduce greenhouse gas emissions associated with food production, determine best management practices for sustainable production, and increase Kernza yields through breeding. Since 2014, General Mills has worked alongside The Land Institute and University of Minnesota’s College of Food, Agricultural & Natural Resource Sciences to research the viability of Kernza intermediate wheatgrass as an earth-friendly, more sustainable grain. Kernza is unique in that its roots grow more than twice as deep (upwards of 10 feet) and are greater in density than current annual wheat roots. A perennial, farmers who produce Kernza don’t need to till and replant the crop every year, minimizing disruption to the soil. Early research shows Kernza’s long roots may help preserve soil, enhance soil health, and reduce nitrogen movement into ground and surface waters. “Research has demonstrated that the ecological benefits of Kernza perennial grain for agricultural systems are remarkable,” said Dr. Lee DeHaan, lead scientist at The Land Institute. “The length, size, and long life of the roots enable the grain to provide measurable soil health benefits and drought resistance while preventing soil erosion and storing critical nutrients – potentially turning agriculture into a soil-forming ecosystem. Cascadian Farm has reserved an initial amount of Kernza perennial grain seed and plans to plant an acre test plot this fall on the Cascadian Farm home farm next to the Skagit River in Washington. The farm team will closely monitor and research how the grain fares in the unique temperate rainforest ecosystem in partnership with The Land Institute. Cascadian Farm joined General Mills in 2000 as the company’s first organic brand. Cascadian Farm has a history of leading the company’s corporate sustainability efforts, and was recently one of 50 product brands to endorse Carbon Underground’s guidelines for “Regenerative Agriculture” to further the brand’s commitment to soil health by supporting farming practices that have a positive impact. I met and shared beers with visionary Wes Jackson many years ago when he lectured in Ann Arbor. His work will have resonance for centuries to come. Perennial plants do not have to be reseeded or replanted every year, so they do not require annual plowing or herbicide applications to establish. Perennial crops are robust; they protect soil from erosion and improve soil structure. They increase ecosystem nutrient retention, carbon sequestration, and water infiltration, and can contribute to climate change adaptation and mitigation. Overall, they help ensure food and water security over the long term. Many fruit, forage and some vegetable crops, including fruit trees, alfalfa, grapes, asparagus, and olive trees, are perennials that have been grown for thousands of years. The Land Institute is working to add perennial grains, legumes, and oilseed crops to the list. Perennial grains, legumes and oilseed varieties represent a paradigm shift in modern agriculture and hold great potential for truly sustainable production systems. In addition to identifying and developing perennial food crops, The Land Institute also conducts ecological intensification research in order to put those crop plants into diverse mixtures called polycultures that mimic the benefits found in native and natural ecosystems. Farmers have been domesticating wild perennial plants for the last 10,000 years. This is the approach that resulted in many of our current crops. Domestication starts with identification of perennial species that have one or more desirable attributes such as high and consistent seed yield, synchronous flowering and seed maturation, and seed retention, also called non-shattering (a feature of non-shattering plants that hold onto their seeds like an ear of corn rather than disperse them over the landscape like a dandelion). Large, diverse populations of the crop are grown out at The Land Institute, and plant breeders select the best individuals for the traits of interest. These individual plants are then cross-pollinated, and the resulting seeds are planted to produce the next improved breeding population. I’ve started to see Kernza offered and am thrilled about these developments. They call for new techniques as well, to go with the new crops. Perennializing tomatoes, peppers and other vegetables is an ongoing project and can help as well but we have to de-industrialize and dechemicalize agriculture as well. Agroecology is one term, but small-scale, low-meat organic permaculture is a broader, more inclusive term. As in so many of these struggles, it’s a race between conflicting pulls toward intensification of the authoritarian, fearful, rageful destructive tendencies and the healthier, more connected, impulses. The merger just approved in both Europe and the US of Monsanto and Bayer creates a much more powerful force against us. The new corporation will need to be nationalized and shut down just like fossil fuel corporations, for us to transform agriculture the way we need to, very quickly. Fossil fuel corporations are failing, having their income eroded from under them, so Monsanto-I.G.Farben might be even harder to defeat than Exxon and Koch. Since fewer people understand the connection between agro-chemical corporations, climate catastrophe and the larger ecological crisis, the first step of education and organizing is crucial. Tomatoes and peppers are actually perennials. It’s only the fact they can’t survive cold temperatures that restrict them to being single season crops in cold winter climates. A real live story of innovation and relief to the “suicidal” climate struck agricultural belt in India. After examining the long term history of the “100th Meridian” – eyeopening news for the agricultural mid-west plains. Masanobu Fukuoka, (1913-2008) was a pioneer in this concept. Of course there is also the work of Bill Mollison and David Holmgren. But I like Fukuoka better because not only did he “talk the talk, he walked the walk”. In 1975 Fukuoka wrote the book “One Straw Revolution”, I would suggest reading the book, it is excellent… because once you do you will look at what General Mills is doing and realize that is at best a half hearten attempt. With all due respect, this article reads like an attempt to get good PR, $500,000 charitable contribution (I wonder what the “conditions” on that contribution are and how much of it is a tax right off?)…. now lets compare that to the 2015 Nets Sales by General Mills of $17,630,000. Bill Mollison is considered the “father of permaculture”… his book is good, but I like Holmgren better. Bill has a lecture series (he is a good speaker IMO) posted on the web if you want to learn more. I’m not sure in what way Mollison didn’t walk the walk. Everything I’ve read and heard was that he did, although he certainly was the same irascible old coot the video shows, even when he was fairly young. In any case, the system of decision-making for organic farming and gardening he devised (with David Holmgren) is brilliant, and if civilization survives the current ecological crisis he will be as responsible as anyone on Earth. The whale story was horrifying from the start because I’ve read that whales don’t clot well and can die from even a small wound. Can’t confirm that with quick research online. The best books on permaculture I know of (having read both An Introduction to Permaculture and the much more complete Permaculture: A Designer’s Guide) are Toby Hemenway’s Gaia’s Garden, especially for temperate climates, and Jacke and Toensmeier’s mind-blowing 2 vol. Edible Forest Gardens. Toensmeier’s Perennial Vegetables is also superb, though mostly for Mediterranean and warmer climes. Mollison’s books are mostly about subtropical, especially Australian permaculture, though both the principles and the Principles are more widely applicable. « Can We All Just Take a Breath?